My eyes (and camera) seem to be constantly on the sky this time of year, because I LOVE the birds of Winter!!! Hmmmmm, that reminds me, I need to go refill my feeders. Any volunteers to come hold the ladder for me? 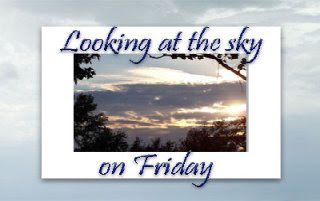 That is, of course, after you post a sky photo for this fun new meme... Just click on the badge and join in. Don't forget to gather up your critter photos and join Camera-Critters tomorrow!!! Oh, how cool!!! What a great shot. Is that a wood pecker? Very cool. Thanks so much for playing. Your support is greatly appreciated. You rock!! Take care and hope you had a great Christmas. Be safe & Have a Happy New Year!! I will hold the ladder for you because I don't like to climb them LOL. Beautiful photo ~ I wish I knew what kind of bird that is. Hope you had a nice Christmas! Those are some great & beautiful photos taken !! 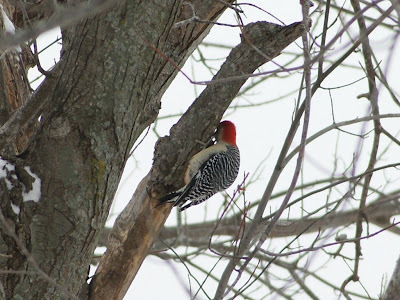 Red-headed woodpecker? Is that right? Great picture! You can look for the birds and I will look for the clouds as that's where my eyes seem to go these days! Nice to see that you're participating in Tisha's fun new meme and of course I forgive you! I've been lousy about visiting myself - work is just wearing me down these days. I really need a nice long, relaxing vacation but alas, I don't think that's going to happen anytime soon. I guess we just need to persevere, right? Nice shot of a Red-bellied Woodpecker, Misty. Based on the amount of red on its head, I do believe it is a male.